LISTEN AGAIN because music is sustenance (don’t forget to eat though!) – podcast it here or stream on demand from FBi’s website. So. The appalling suicide bombing in Manchester this week, aimed at causing carnage at a place of innocent joy, because of the perverted extremist beliefs of a small number of people, have been on my mind this week, and they connected kind of weirdly with some completely unrelated Manchester news – the return after about a decade of beloved idm producer Bola, a Manchester artist on Manchester’s legendary Skam label. I was reminded that 20 years ago Bola, among many other interesting artists, contributed a still-exclusive track to a compilation called 0161, co-released by Skam and V/VM, which commemorated a devastating bombing by a different terrorist organisation, the IRA, that flattened much of the centre of Manchester. In that event, warning was given and although there was huge damage and many injuries, not a single person died. In any case, for better or worse this long-out-of-print compilation is really excellent, with some great deep cuts like the Bola, and The Fall, led by Manchester’s crabby uncle Mark E Smith, rather surprisingly turned up with some electronic beats wrapped around the postpunk guitars and Smith’s ranting – pre-empting Smith’s work with the likes of Mouse on Mars by many years. So, we are planning to focus on strings for much of tonight, but very little of it is straight cello or violin. The amazing collaboration between John Matthias & Jay Auborn, both composers & interesting producers, starts us off with Auborn’s piano, Matthias’ violin, and glitchy electronic beats… I don’t know Auborn’s work, which is mostly unreleased sound design & soundtrack work, but Matthias has been on my radar for over a decade, through releases on Matthew Herbert’s Accidental Records, work with Coldcut, contemporary classical composition on Nonclassical, and more – he’s a sensitive songwriter, electronic producer, and a fine violinist as well (in fact his string arrangements can be found way back on Radiohead’s second album The Bends). 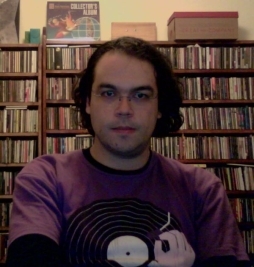 Dutch producer Michel Banabila appears a lot on this show, with his world music-influenced electronica both solo and in many different collaborations. Here he’s working with adventurous Dutch cellist Maarten Vos on works for choreographer Conny Janssen. There’s a fair bit of the bouncy electronic beats and exotic samples that are often found in Banabila’s works, but also many acoustic instruments, played by both Banabila & Vos. Cello isn’t always recognizable but it’s certainly prominent in the second track I played. Yair Elazar Glotman also appears a lot on this show, for his submerged bass-heavy techno as KETEV and his amazing sound design. His works under his own name feature intensely close-mic’d double bass, and the insides & outsides of that instrument feature on his new album along with many other instruments. For his new album on the ever-reliable Miasmah label he’s working with Swedish producer Mats Erlandsson, who’s got some releases on the industrial/experimental label Posh Isolation. I’m not sure whether Erlandsson is a cellist or violinist, but it’s likely both are multi-instrumentalists as well as excellent sound designers. It’s “acoustic doom” (Miasmah‘s frequent genre of choice), with scraped & twanged double bass haunting a space full of wheezing singing bowls, sighing cello, and sometimes enveloping guitar jangles. Adrian Copeland also makes something like acoustic doom, naming himself after two types of wood that go into many string instruments. His album from last year as Alder & Ash is being re-released now in beautiful physical editions by Lost Tribe Sound along with his new one, and both find him looping and distorting his cello into beautiful mysterious structures – sometimes influenced by doom metal, sometimes by drone or experimental folk. It’s intense. I was so pleased when I discovered that the wonderful, prolific Montréal-based cellist Rebecca Foon had formed a solo project called Saltland. Foon co-founded chamber/postrock ensemble Esmerine some years ago, and is also a central member of Thee Silver Mt Zion, as well as appearing all over the place in the extremely fertile Canadian music scene. The Saltland material is very much based around her cello and her smooth vocals, but she mixes it in with percussion, electronic programming and other instruments when called for. Her new album and the previous are two rich and lush releases which just happen to have a lot of cello on them. Who could complain? Returning to Lost Tribe Sound for our last two artists tonight. Michael Cottone has recorded his ambient & electronic music as The Green Kingdom for some years now, but in his talks with Lost Tribe Sound he was asked to make this album out of predominantly acoustic sounds. It’s shiny and summery on the whole, and has that rickety feel of Bibio’s earlier releases, folk instruments filtered through a hip-hop lens. UK guitarist Andy Cartwright has released a number of albums now as Seabuckthorn, showcasing his fantastic fingerstyle guitar technique as well as his love for extending the guitar through bowing, strumming, and sometimes through subtle production techniques. The sounds are never less than gorgeous, as if James Blackshaw took a different tangent somewhere along the way… Although the circular, Blackshaw-like fingerpicking is always a joy to listen to, the mournful bowing that appears on some tracks is something to experience.